None of us like to think of the passing of our companions but as responsible horse owners, it is something we all need to give consideration to. Whether we are faced with end of life decisions due to illness, catastrophic injury, chronic pain, or simply old age, we need to keep in mind all of our options and consider what is best for the horse and us physically, emotionally and financially. Some of these decisions are things that you can think of ahead of time such as whether you would take a horse to colic surgery or what constraints you might have in treating a severe injury such as a fractured leg or lacerated tendons. The answers to these questions can certainly depend on both your personal situation and the animal's personality and their “value” to you. The definition of “value” is not entirely based on the dollar value of an animal. There are often other more intangible aspects of value that can come into play in making decisions. A broken heart - in some cases with the death or euthanasia of a companion, the option of euthanasia of the remaining horse may be a kind consideration especially if that horse also has health issues. Is my horse still enjoying life most days? We all have good and bad days but when the bad days outnumber the good ones, it may be time. Is my horse keeping a good appetite and maintaining an adequate body condition? Older horses that are very thin often have great trouble making it through a winter. Without any fat reserves to use to keep warm, many of these horses start to use muscle tissue to create heat which can lead to weakness. We often find these horses can do well until late winter to early spring then they “run out of gas” and we find them down and unable to get up. This is a heartbreaking situation for all involved. If despite a diet appropriate for your horse given their age and dental status fails to help maintain their condition, it might be time. A horse with a chronic illness that stops eating is often telling us that he doesn't feel well enough to continue to go on. Does my horse have a chronic, debilitating illness or injury that has no hope of improving? Are they in pain that is not easily controlled with standard pain medication? Some horses can have their pain controlled but may reach a point that they can no longer tolerate standard pain relievers and develop severe ulcers. 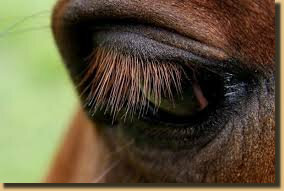 If a horse's pain cannot be controlled, euthanasia should be considered. Can I not afford financially or time wise to adequately treat the horse as it needs to be cared for? Simply not being able to afford to feed an animal does not mean it should be euthanized. In that case, the animal should be sold or a good home found for it. If an animal is chronically or acutely ill and you don't have the financial resources to care for the animal, euthanasia is an option. We don't like to think about euthanizing an animal simple because we can't afford to treat them, but the reality is that many treatments available are very expensive (ie. colic surgery) and the thought of spending many thousands of dollars is just not realistic for some of us. There are more options available to clients for financing care for their pets including Care Credit which we offer at our hospital. This allows those clients that qualify (and we have found that most do!) to have extended payment terms for procedures done on their animals. The bottom line is that you need to do what is best not only for the animal but also for you and your family. If the horse is ill or injured, what is the time frame for recovery, will the horse regain its former function, what will the horse's lifestyle need to be during recovery and after? For some horses, the prospect of a lifetime in a stall is untenable. For other working or show animals, there are some that are truly not happy unless they are working. We owe it to the animal to consider the psychological aspect of their life. Some animals would be happy as a pasture ornament and others would be miserable. For some owners, maintaining as pasture ornament is simply not an option. These are just some of the considerations in making a decision to euthanize an animal. We will help guide you through the process and consult with you as needed. These are often difficult conversations even for the doctors, especially if we have all worked hard to help an animal get well and we expect and are not embarrassed by tears and other displays of emotion. is whether they would like to be present during the euthanasia or not. Each person has their own feelings about this from I don't want my horse to be alone with strangers at the end to I don't want my final memories of the horse to be the euthanasia. For many owners, it is heart-wrenching to watch a treasured friend be put down. The reality is that horses are big animals and unless they are down and unable to get, they will fall down when they are euthanized. It can be very disconcerting to watch this for many people. We always give owners the option of staying with their animal or not. Rest assured that we treat the horse as one of our own animals whether you choose to stay or not and for many animals, if they are sedated, are not aware of what is going on around them and won't be aware that you are not present. We also tell owners that they are welcome to leave at any point. For many owners this means staying up to the point where the animal is walked out to the burial site or leaving just before the final injection. Each veterinarian has their own particular routine so comments here will be what our process generally is. You may want to ask your veterinarian what his or her routine is. After the decision is made to put a horse down, we consult with the owner as to their wishes in a variety of areas. If the horse is ambulatory, we can move it either out of a stall or near where the horse is to be buried. We will not euthanize a horse on the edge of a grave due to the risk to people and the horse if something does not go as planned. In some cases, it is not feasible to move a horse very far from where it is; in this case, we try to at least get them to a place that is easily accessible by a tractor or truck. An intravenous (IV) catheter is placed in the jugular vein. This allows secure access to a vein. Depending on the situation, the horse may be sedated. With horses with fractured limbs or neurologic problems that make them unstable, we often do not sedate them to avoid having them get even more unstable. If a horse is down, we often sedate them very heavily so that they do not attempt to get up during the process. Next we give the horse the final injection. We use a product that is a barbiturate which essentially amounts to an overdose of an anesthetic. 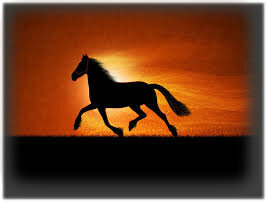 The horse rapidly goes into deep anesthesia which is quickly followed by the heart stopping. During this process the horse may take one or two deep breaths or even sigh. The doctor will listen for heart sounds and stay with the horse until the heart has completely stopped (usually in less than two to three minutes). 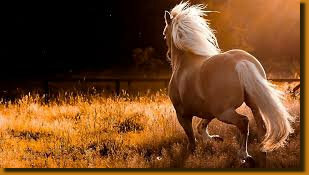 Occasionally the horse may take one or two last breathes which is the nervous system shutting down. These are variable and are often the most disturbing part of watching the euthanasia. Rest assured that the horse's brain function has stopped at this point and these are not truly “breaths”. 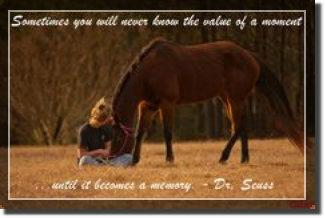 Following the euthanasia we often will leave you to spend some time with the horse if you would like. We respect that many of us need to say a final goodbye. If you opted not to be present during the injection, but would like to see the horse afterward, we can come get you once we are done. If burial is not an option, you could transport the horse to Cornell University for private cremation. This is an expensive option (costing upwards of $600 at last check). You will receive your horses ashes back and can keep or scatter them as you wish. Calling a rendering truck is also an option. The cost is generally $150 to $250 which involves not much more than having a backhoe come to your farm in many cases. The body is picked up by a winch truck at your farm. A necropsy (animal autopsy) can be performed at Cornell University if there are questions as to what might have caused the animals' illness or injury. They will take care of disposal of the body following the procedure and owners can also opt for private cremation if desired. This might be a valuable way to gain information on what might have happened. The costs are variable depending on the situation. The basic necropsy costs $80 but if additional tests need to be done the cost can increase. Generally currently they are running about $130 for a full necropsy. A basic necropsy can be done on farm by one of our doctors prior to burial. One consideration for owners of multiple horses is what to do with the other horses that might have been companions to the one that was euthanized. Many people feel that allowing the other horses to see the horse after euthanasia helps them understand what happened and where their “friend” went. Most animals have a better understanding of the concept of death than we do and may be less distressed than if their friend simply disappeared. If a companion seems very distressed or depressed for more than a day or two please let us know as there are things that can be done to ease the transition.